Spacelab was a purpose-built laboratory, providing a pressurised shell for outfitting with science racks that could be exchanged and adapted for a specific flight. In addition to power and thermal control subsystems, there was also a communications system to and from the experiments and provision for airlocks and pointing systems where required. An array of computers and associated software handled the management of the subsystems, experiments and data flow. The crew could oversee and intervene in experiment operations, monitor subsystems and, where required, repair faulty equipment or amend the collection of data to reflect real-time situations during an experiment process. 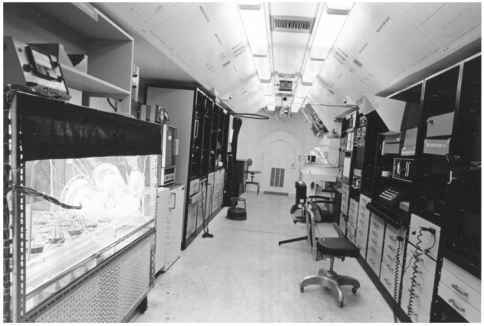 The interior of the October 1974 SMS module showing the laboratory-like racks to simulate Spacelab science racks. Musgrave injects nutrients into the root system of pine seedlings during the October 1974 Spacelab life-sciences simulation. (this was later extended up to seventeen days), offering greater science capability than the pioneering US space programmes, but far less than the Skylab missions. Though restricted by the design parameters of the Shuttle in terms of launch weight, mission duration, consumables and crew time, missions could repeat flights of the same hardware, or with amendments to the hardware on later flights based upon the experiences of previous missions. A dedicated science crew could operate independently of an orbiter crew and work over two twelve-hour shift cycles offering, on a ten-day mission, twenty man-days of operations. For the NASA scientist-astronaut team, it provided the opportunity to ply their trade in space and combine their astronaut and pilot training with their scientific and engineering background. 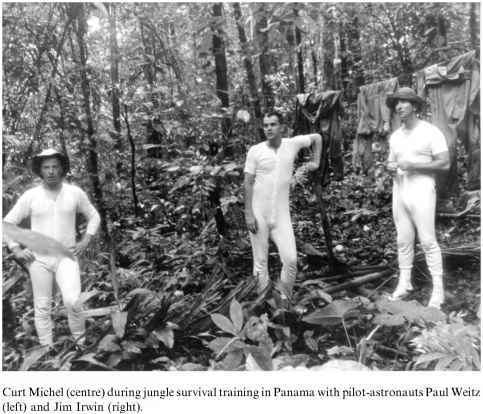 Experience gathered from Skylab also helped identify effective working practices that were applied by several scientist-astronauts in their work on Shuttle/Spacelab development issues. But it was clear that Spacelab was no Skylab, and what NASA and America really needed was a Shuttle programme that included Spacelab for short-term research and a space station for long-term research. In the 1970s that prospect, though often promoted, looked increasingly remote, as it was becoming a challenge just to get the first Shuttle off the launch pad, let alone fly a dedicated science mission. The term "Spacelab" is generally applied to the missions carrying the pressurised laboratory, but in fact it also applied to the missions carrying a pallet-only science research package, or a combination of both. The size and combination of the "Spacelab payload'' depended on the specific mission being flown inside the Shuttle payload bay. Access to the laboratory was via a 1-m-diameter transfer tunnel from the mid-deck aft hatch to the Spacelab module. The EVA hatch was incorporated into the forward end of this transfer tunnel, giving a "shirtsleeve" environment from the Shuttle flight and mid-deck, via the tunnel, to the laboratory. In addition to the pressurised module, there was a limited space available on the mid-deck as well as facilities for a small amount of Spacelab support work on the aft flight deck of the orbiter. The Short Module (SM) consisted of one, 4-m-diameter pressurised cylindrical module, 2.7 m long, enclosed between two end cones. This was the core segment which contained the Spacelab subsystems supporting the laboratory facilities. There were also eight cubic metres of space available for experiment hardware. This configuration was never flown on a Shuttle mission. The Long Module (LM) comprised two short module elements, with the core segment augmented by an experiment segment giving a further 14.6 cubic metres for experiments. 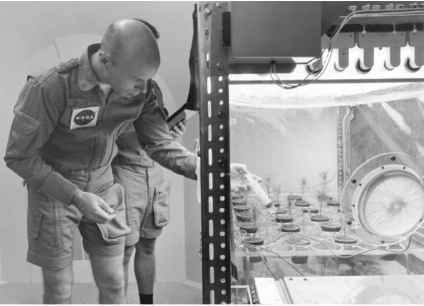 Inside the laboratory sections, experimental research hardware was located in 48-cm laboratory equipment trays, which could also be mounted centrally on the "floor" of the module. The Spacelab Pallets (SP) were available to support unpressurised equipment, experiments and associated hardware. Each U-shaped pallet measured 3 m long and 4 m wide. These could be mounted singly, or in a series of up to five called a "pallet train''. In the case of a pallet-only configuration, all the essential subsystems were located in a 1.1-m-diameter cylinder, termed an "igloo", located at the front of the first pallet. Experiments on the pallet-only payload could be controlled from the aft flight deck, the module or the ground, or in some cases adjusted by contingency EVA. With a combination of short or long modules, modules and pallets, or pallets only, the system was extremely versatile and could support a range of missions in various fields. Laboratory modules usually supported life sciences, material and microgravity studies, while pallet-only missions supported astronomy, Earth studies or space technical development. Not all Spacelab missions were termed "Spacelab" and between 1981 and 1998, over thirty missions carried or featured Spacelab components. Members of the scientist-astronaut group were instrumental in the development of, and operations from, the early Spacelab missions, but before these could be flown, a significant amount of work had to be completed on the ground in developing the hardware, experimental protocols, procedures and operations. Between 1973 and 1978, when the first crews for Spacelab were named, several members of the scientist-astronaut group participated in ground-breaking and important simulations geared towards flight-qualifying the hardware.